TROPOMI on board the Sentinel 5 Precursor (S5P) is in Operational Mode. The TROPOMI instrument was successfully launched on 13 October 2017 at 11:27 CEST/09:27 UTC and has successfully completed a series of important calibration and instrument tests during the six-month Commissioning Phase which concluded at the end of April 2018. The instrument is now in nominal, operational mode. 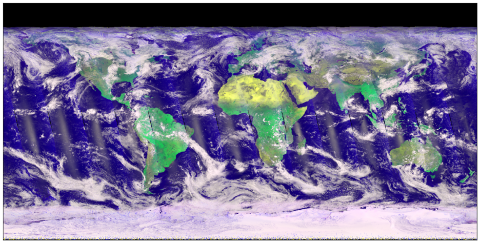 Here below, one of the first RGB images produced from TROPOMI data for 13 November 2017 (Image credit: KNMI). The first set of data products was publically released in mid-July 2018. More data products by the end of 2018 and beginning of 2019. A calendar summarizing important mission events and instrument-wide anomalies can be found here. All aspects of S5P mission requirements for quality control, calibration, validation, and end-to-end system performance monitoring are addressed by the so-called S5P Mission Performance Centre (MPC), further described here.